I’m not sure I liked the 70s very much. It seemed rather dark, lots of greys and blacks and blues, uncollected bin bags, jugs of water next to the sink to brush your teeth, torches by the bed for when the lights didn’t work, snow of course, closed schools (not all bad then) and burst pipes. Food wise there was ready grated parmesan, that smelled like sick, gigantic broad beans, always in their skins, that guaranteed indigestion for days after consumption, and strange fizzy drinks, delivered by the “pop-man” (but not to our house) in un-natural colours, that all tasted the same, like wet acidic sugar, and which I craved more than anything because I wasn’t allowed to have them. Oddly perhaps I hardly remember the food that we ate at home at that time. We probably ate pretty well. Both my parents liked food, and they both made time to cook. They valued the place of food in our life, thought about our health, and we had access to pretty good stuff (allowing for the fact it was the seventies, of course). Most of it wasn’t memorable though, not yet. Maybe I was too young. There are some memories however. 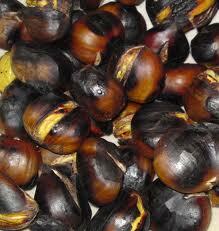 My earliest food memory is of roast chestnuts. I was in my little single bed, in my little bedroom with the pink carpet, the little white box with a patterned orange and brown fabric top (I did mention it was the seventies didn’t I?) and the wide windowsill that I was rather fond of sleeping on, much to the neighbours’ bemusement. I don’t remember why I was in bed. Perhaps I was ill, although if I was being given new and exciting food presumably I did not have a tummy bug. I think it may simply have been (my) night time, and that my parents were still up, down stairs roasting chestnuts, and decided to bring me some to try. It was my father that brought them up to me, and I sat up in bed making a rather poor job of peeling them, finding the thin bronze skins surprisingly strong, and sharp when torn. Happily he peeled some for me. I can remember them now, more a sensation that a flavour, warm, dense, a little pasty. More than anything I remember the sense of this being a treat. Eating when I wasn’t normally allowed to, where I wasn’t normally allowed to. The sensory experience not just in the mouth but in the hands, the involvement of me, the eater, in getting to the tasty bit, these are things that I remember most clearly. I still adore food that gives me that sense of treat, and above all of involvement. Love, love this post! I just made chestnut crème, and am having fun seeing other takes on these fabulous little treats! Thanks, I’m glad you enjoyed it. I hope the chestnut crème is a great success.